A DVD showing the only time Sir Paul McCartney, the late George Harrison and Ringo Starr played together after The Beatles split is to be released later this year. The live footage was recorded at Harrison's Oxfordshire home in 1994 in the build-up to the band releasing their Anthology albums. 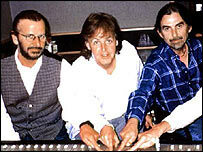 It shows the trio playing five non-Beatles songs, with Harrison and Sir Paul on ukulele and guitar, and Starr on drums. The tracks are Ain't She Sweet, Blue Moon of Kentucky, Raunchy, Thinking of Linking and Baby What You Want Me To Do. The DVD may be released as early as the end of March, and looks set to become one of the biggest-selling DVDs of the year. The previously unreleased footage is on the DVD of the 1995 documentary that accompanied the release of the Beatles' three Anthology albums. A spokesman for Sir Paul said the "jam" session was "really sweet". "It's five old songs that they would have played in the days before the Beatles - it's really nice footage," he said. It was the only time the three played together after the band broke up in 1970. Harrison died in 2001 after a long battle with cancer. Fourth Beatle John Lennon died in 1980 when he was shot by a fan outside his New York city home. The Anthology albums included many alternate versions of Beatles standards and out-takes from their recording sessions at London's Abbey Road Studios in the 1960s. It also included two half-finished songs that were completed by the three surviving members, Free as a Bird and Real Love, which were both released as singles. Meanwhile Sir Paul has announced he is to play his first tour in the UK for 10 years this April. Sir Paul has not played a major UK tour since his New World Tour of 1993. He will also play other dates throughout Europe. The tour follows on from dates in the US and Japan last year. The former Beatle will play 22 Beatles songs at each of the concerts, some of which have never been played live in the UK, and he will perform a rare acoustic slot. "People seem to enjoy the one-on-one-ness of that part of the show, it's just you and me, babe," he said. He also said his last tour had left him "exhilarated" rather than "exhausted" because he had enjoyed it so much. Sir Paul said it was a combination of factors in his life that had made him so happy, including his marriage to Heather Mills. "I could say a good veggie diet. I could say my new wife and romance back in my life. "And I could say it's because of having a new band and really enjoying playing this particular set of songs with them," he added.